Experience the ultimate touring cruiser when you take the 2015 Suzuki Boulevard C90T for a ride. This cruiser comes with all the bells and whistles to make your ride as comfortable as possible. A large windscreen will keep you and your passenger sheltered from headwinds while you enjoy roaring up the roads with the 1,462 cc long-stroke, liquid-cooled, 54-degree V-twin engine. Saddlebags and a comfortable passenger seat are included to maximize comfort and functionality. 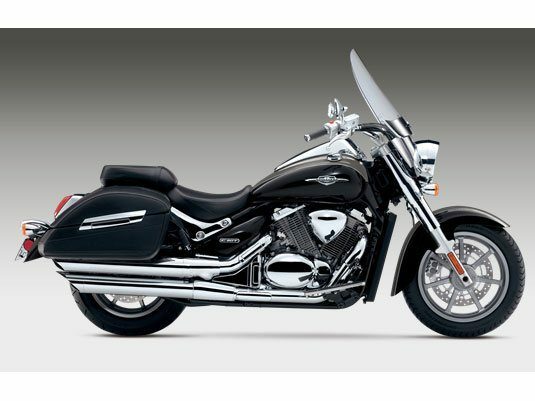 The 2015 Suzuki Boulevard C90T is designed from front to back to deliver the best touring experience possible, and it doesn’t disappoint! Easy to see atop the fuel tank, the C90T B.O.S.S. features a multi-function instrument package highlighted by a large analog speedometer. The package includes a convenient gear-position indicator and a fuel gauge, along with a clock and a trip meter, plus indicator lights for low fuel, turn signals and more. It delivers a level of instrumentation that is not often found on classically style cruisers. Blacked-out exhaust system, engine cover, frame, and suspension.